YOGA IS NOT REALLY SOMETHING THAT I DO; IT'S A PART OF WHO I AM. Current Schedule of on going classes, all levels welcome. Current Workshops and Retreats, Special classes and services offered. Details coming. Don't forget to check back soon. As a sports enthusiast for many years I was really into skiing, cycling, dancing and running. I sort of stumbled into yoga when I lived in the San Francisco Bay Area. To be honest I can’t believe that I’m still practicing, since I’ve usually don’t stay with anything too long. But here I am almost 25 years later and that is the one constant in my life. I was very fortunate to live in the San Francisco Bay Area where I was able to have weekly classes with many amazing teachers, like Sarah Powers, Judith Lassiter, Donald Moyer and Tony Briggs, just to name a few. In those 25 years, I was a performer in a yoga dance company, called the Yoga Garden Dancers that performed around the country. I opened and ran a yoga studio for 10 years in Danville California. I led many retreats, domestic and international and have taught several teacher training programs. In addition I worked at as a trainer and also help develop and run a program for seniors. 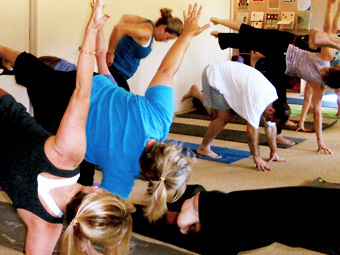 ...are a mixture of many styles fused from a base of Iyengar Yoga. I use my dance background to create fun Vinyasa classes, I use my trainer skills to create strong power classes, and I use my Iyengar training to help with alignment and utilize props, (chairs, blankets, bolsters, etc) in many creative ways to help students get the most out of their practice. I don’t teach “Laughing Yoga” but it seems that we do quite a bit of that in my classes, for I find many things amusing and feel we all need to lighten up a bit. Yoga is not really something that I do; it’s a part of who I am. I live in Myrtle Beach, SC., with my 2 cats, Bonnie and Clyde, and enjoy paddle boarding, kayaking and golf. I return to California each year for retreats and workshops, so keep checking this site for updates.